For the past ten years, the RoadAbode Crew has taken a family trip in June. For our family it's a great way to celebrate the end of the school year and really get's us into our "summer groove". This year's trip we wanted to stay closer to home and do a tour of Central Pennsylvania. There are plenty of great spots to hit, but we only have ten days to fit the trip into.After a few discussions (and concessions by me to cut back how many places to visit) the RoadAbode Crew finally decided on our destinations for this year. 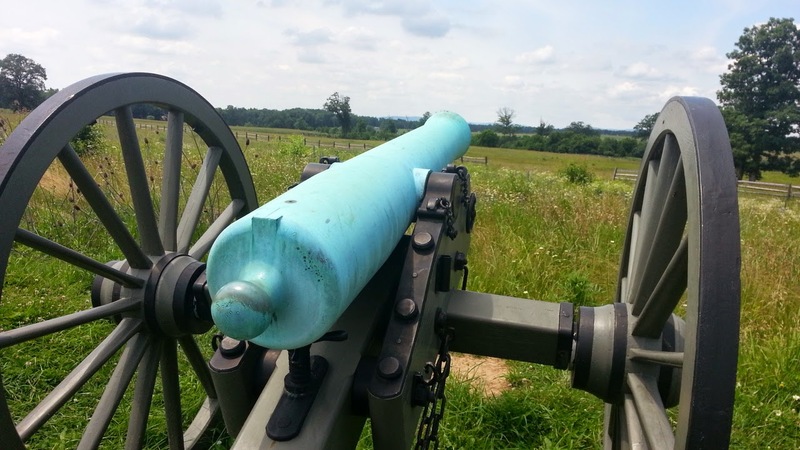 We've never been to Gettysburg Battlefield, so we wanted to check out the history and what else the area had to offer. We decided to check in on an old family favorite, Knoebel's Amusement Park, with a short visit into the abandoned town of Centralia, and finally head to a campground outside Fort Indiantown Gap Pennsylvania and spend a few days relaxing creek side at Jonestown KOA. The Battle of Gettysburg took three days in the heat of July 1863. Thinking you can experience and learn about this pivotal battle or tour the area in the same time just can't be done. There are plenty of options to camp in the Gettysburg area. When we learned that we could stay next to a creek at Gettysburg Campground we decided to stay there. The girls love searching for crawdads fish and other creatures when we relax at our campsite. The campground has over 260 sites, including those for tent campers. Some of the sites do back up to Marsh Creek, Our site number was 52, and though we did back up to Marsh Creek, the bank at our particular campsite was steep and overgrown with underbrush, no easy access to the stream bank at all. If staying and you want creek access, we would suggest sites 54 through 58 and 235 thru 238. The campsites are all gravel, and all seem quite level. The amenities at the park are great, including a fully stocked store, clean restroom/shower facilities, and landscaping that was well kept. Though we didn't use the pool on this trip, looks like plenty of people were enjoying a dip. Another plus of this park is JR's RV repair shop right on the property. We could see that as being handy if you needed something repaired while vacationing in the area. Molly enjoyed the large dog walking area near the entrance to the campground. The campground is on the outskirts of the town of Gettysburg, but close to drive to the fields where the Northern and Southern armies engaged, and see historic farmhouses where the injured were taken to be treated. The Battle of Gettysburg lasted for three days in the heat of July in 1863, and has become known as the turning point of the American Civil War, and inspired Abraham Lincoln's Gettysburg Address. The fierce battle and loss of life changed how future wars the United States would be involved in were fought. On this trip, I'd be correct in saying we discovered our girls are not civil war buffs. As we toured, places I would have stayed and learned more about the reason and story behind monuments, they were ready to run to the next item on our list. I had downloaded some really well done podcast audio tours and maps of the various important battle areas. Though really interesting to me, the podcasts did not hold the girls interest. Nothing wrong with the podcasts, they are informative and interesting stories, just not something that 20something and teen girls wanted to sit still for. We did stop at the Pennsylvania Monument. 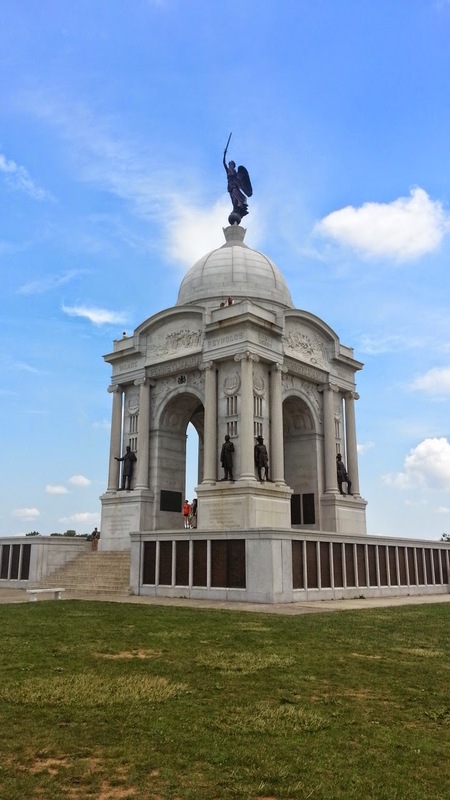 The State of Pennsylvania Monument is the largest monument on the Gettysburg battlefield. On top is a statue of Winged Victory which stand on top of the dome; its metal came from a melted down Civil War cannon. Just thestatue is over 7000 pounds. The girls climbed up the stairway to the roof to glimpse beautiful views of the battlefield and surrounding land. Another area the girls did find interesting was the Cyclorama found in the Gettysburg Museum and Visitors Center, which is administered and run by the National Park Service. I don't want to give away spoilers, but I felt intrigued by both the portrayal of the battle, and the background history of the Gettysburg Cyclorama. Talking back at our campsite, we felt the Museum and Visitors Center were the highlights for our Gettysburg portion of our RoadTrip. Take the time, and wander through the museum. Learn more about the individual stories of the young men on both sides of this conflict that gave their lives fighting for what they believed was right. Interest of individual locations of engagement will vary by what state you are from, or what story catches you. One storied battle area that I personally found interesting was Devil's Den. The stage for this battle was set by an outcropping of large boulders located in a valley facing Little Round Top. Confederate sharpshooters took cover among the crevices and in between the large rocks. Though only a few men, they succeeded in holding their ground while picking off Union artillerymen and officers. Having read about this particular battle, I was interested to see and walk the topography of the site. To understand how this Confederate standoff occurred, it really helped to visit this particular site. 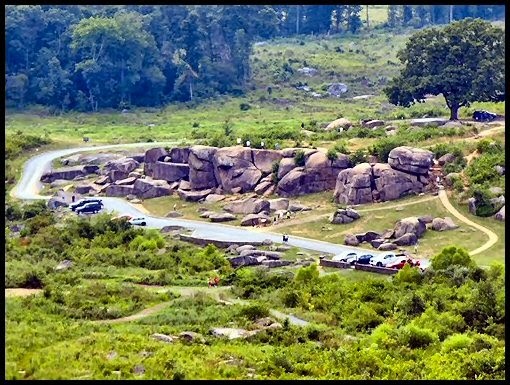 We saw that kds love to climb the boulders of Devil's Den and of Little Round Top, but make sure if your do, they are supervised and make good choices. Even though run by the National Park Service, you need to be cautious as terrain can be uneven with steep slopes and drop-offs. It's worth the trip - even if you are not into the history of the civil war, to understand what these men went through can be stirring. For some visitors, perhaps the spectacular views of the countryside from Little Round Top are worth the visit. When roadtripping in RoadAbode , I always enjoy sampling some local fare. Since this trip was closer to home, we already are familiar with Philadelphia scrapple and cheese steaks, or shoo-fly pie and sweet & sour chow-chow of Lancaster. Though I had read about the historical staples for both the North and South, I didn't see any hardtack or salt pork for sale, which were the two most common foods provided to Civil War soldiers on both sides of the battle. Probably not something I'd want to eat a lot of, but I'm always up for a new taste! Instead we enjoyed some regular fare. Tommy's Pizza, was our favorite! I've caught conversations of the girls still talking about the hand-formed dough - crisp yet still soft on the interior; and the fresh toppings we had on our vegetable pizza. It was the first pizzeria we've been too that the wanted to revisit the next day for more of the same. If the girls come back to Gettysburg, part of the reason will be fror Tommy's Pizza. General Pickett’s Buffet in the "all you can eat" style of dining was great after a day touring out in the battlefields, This eatery offers a variety of standard buffet fare, with plenty of choices so everyone can find something they like. It's not fine dining, but sure was tasty and filling. General Pickett's also has a gift shop and "Battle Theater". Though we did not take time to visit this attraction, it sounded interesting, featuring a miniature diorama, which depicts scenes from the famous battle. The main attraction is a 30-minute sound and color presentation that describes battle times and places, army advance and retreat paths and a complete animation of the three days of battle. Both Tommy's Pizza and General Pickett's Buffet are on Steinwehr Avenue (Business Route 15). After dinner, we strolled along Steinwehr Avenue past quite an array of touristy shops, bed and breakfasts, and various fooderies. There are plenty of tours of the battlefield and surround area to chose here, from tours by dressed re-enactors to nighttime ghost tours, and tours by horse-drawn carriage or air conditioned coach. One unique aspect of the tours of Gettysburg is the "Association of Licensed Battle Guides" The battle guides association is close to 100 years old. Guides need to pass a certification process sanctioned by the US Government. Today, more than one hundred Association guides conduct thousands of tours for visitors around Gettysburg and other battlefields of the Civil War each year. For the RoadAbode Crew, all this would have been lost money on our uninterested girls. Next Time I'll maybe go without them! I really enjoyed learning about the history of Gettysburg. Perhaps when I visit Gettysburg again, I'll make it an awesome "Guys Trip". Besides the over 1300 monuments to the soldier on both sides of the conflict, there are plenty of attractions to take part in. Museums, Soldiers National Cemetery, theaters, wineries, a Cidery, brew pubs, and more. Looking forward to going back! Knoebels has been America's largest free admission park for over 85 years of operation. Sandwiched between mountains in a wooded grove straddling Columbia and Northumberland Counties, the award winning amusement park has been highly rated for it's rides and food. The park originally started as a place to picnic and swim in the waters of Roaring Creek which run through the grove. In those first years the Knoebels family added a carousel and a pool of filtered water - Crystal Pool - and the amusement park was born from there. 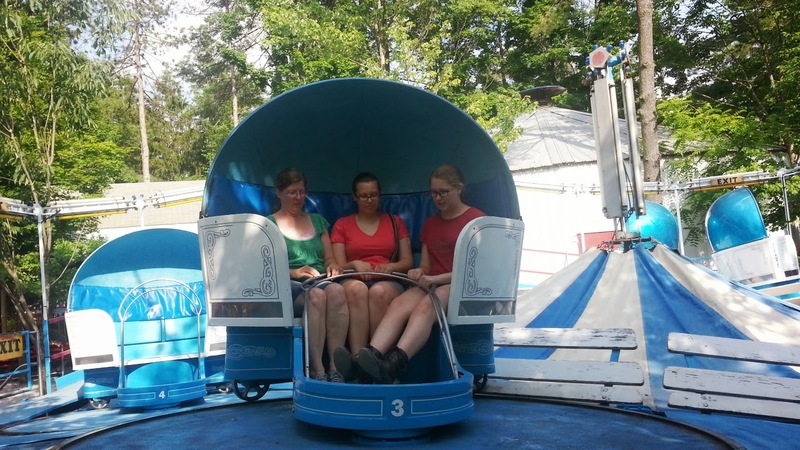 The RoadAbode Crew love Knoebels for it's family friendly layout and the no entry fee policy. Parking is even free. It's great to bring along grandparents who don't "DO" the rides anymore, but still want to enjoy watching the kids have fun. Also, it's wonderful that Knoebels has great rides for all, from toddlers to teenagers. There are size and age appropriate versions of older kids rides for wee ones to get thrilled on. Some of the rides have been here for decades, yet are well maintained and lovingly cared for. The Main Carousel (one of two traditional carousels in the park) is a "I gotta do that" ride. With moving and stationary horses, and even comfortabe benches, the ride is appropriate for everyone. Sit on the outer horses for a chance to grasp the brass ring! If you missed it, don't worry, you can buy an engraved keepsake at the Carousel Museum.Our girls love coming back year after year for old favorites, from bumper cars, Italian Trapeze, two miniature steam engines, to the motorboat ride they can steer through part of the park. Not all the rides are "old school" and Knoebels is known by Roller Coaster enthusiasts for the Twister, Phoenix, and Flying Turns Coasters. Also announce is the building of another massive coaster to be called Impulse. Other favorites for youngsters and oldsters alike are the shows featuring bands, singing groups, or other talent. You can even learn something in museums of carousel horses, Knoebels history, and of coal mining. There are plenty of places to sit on a bench in the shade and take in some people watching and the menagerie passing by. What's great about Knoebels for RVers are their two campgrounds; one right next to the amusement park and one a short shuttle or car ride away . The campground next to the park offers limited electrical connections and water fill connections in each loop or section. For those really into roller coasters, there are even campsites right next to the Twister. Lake Glory Campground offers full hookups for each site. Both Campgrounds offer well stocked camp stores and cabins for those friends you invited without a tent or RV. We have stayed at both campgrounds, and though we like having the ability to walk right into the amusement park from our campsite, we prefer the full hookups at Lake Glory. The Lake Glory campsites are more of a wooded setting, and feel more spacious. It's nice after being at the park all day and coming back to a quieter setting. If you leave Knobels without trying the food in the amusement park, you've missed half the experience. Local birch beer, and favorites like pierogies, tri-taters and the fresh hot waffle ice-cream sandwich are just a small sampling of the home-cooked goodness that awaits at the amusement park. There are choices to grab wherever you are throughout the park, and even a sit down full service diner. The International Food Court near the Phoenix roller coaster features tastes from around the world. Knoebels has been the Golden Ticket winner for food quality and value for over the past 10 years They were just edged out in 2014 by Dollywood in Pigeon Forge, Tennessee. The food at Knoebels is one reason I'm always up for a trip there! 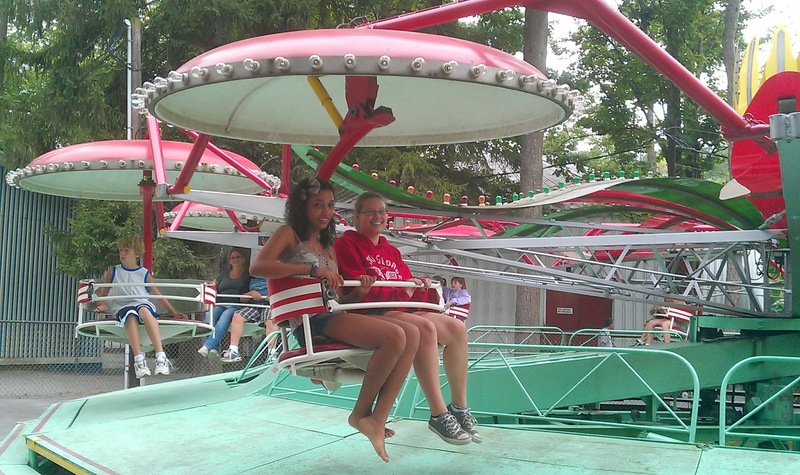 What our family loves about Knoebels are the rides, the food and the overall relaxing fun. It's a family-friendly place, and a good value. It's a unique piece of Americana that we recommend you visit! Other attractions near Elysburg include the Knoebels Golf Course, a beautiful natural area called Weiser State Forest, and the Pioneer Tunnel Coal Mining Tour. Not a far drive from Knoebels is the town of Centralia. Not officially an attraction, it is infamous as the town that is burning underground since 1962. This is "coal country" and the hills here have a rich history of miining. I had previously visited Centralia by myself a few years back, and now that the girls are a bit older, wanted them to see this town that has become equal parts legend, truth, and folklore. I drove the girls around the grid pattern of streets with no homes, just plots with overgrown trees, sidewalks, street signs, and fire hydrants. We walked together and I showed them fissures in the ground near the dump where the underground fire started. Wisps of smoke and gases still rose up and you could feel heat coming from deep within the ground, still 50 years later. There are far less warning signs than I remember. 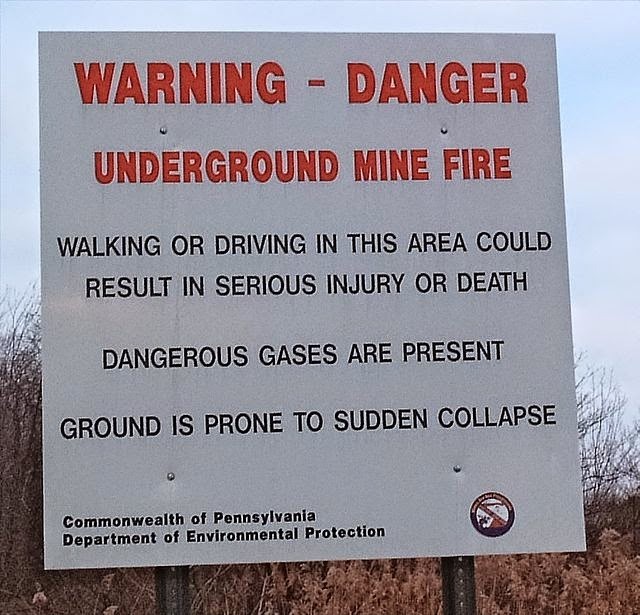 What are left still remind of the hazards of noxious gases and possibilities of cave ins.. We also hiked down the closed section of Route 61, with it's deep cracks from the underground fire and surface covered heavily with graffiti . Must be a right of passage when graduating high school to tag the road with your name or other symbol. There are fewer then ten residents living in the area, and we continually saw the curious stop, get out, take a few selfies with smartphones, and move on. It's curiously sad and eerie at the same time. If driving to the Centralia area with your motorhome or trailer in tow, know that the area is mountainous and there are some steep and long inclines to travel up AND down. Jonestown is not a mecca for tourists. It doesn't have tons of award winning restaurants, or must do attractions by the handful. Even the State Park is not on a list of biggest or best. For the RoadAbode Crew, that is fine by us. This small town community may be a little off everyone's radar - and is exactly what we are looking for to just put up our feet and relax toward the end of our week. Jonestown KOA, formerly named Lickdale Campground, is a medium-sized campground with great amenities. The campstore also operates as a local Ice Creamery and convenience store. Want a broasted chicken, or sandwich along with that pack of firewood? They've got you covered. (and they can deliver too!) Whenever we go, we book one of the "pull up" stream-side campsites. Not exactly a pull-thru, as you are parallel between the road and the Swatara Creek. Swatara is also the name of the State Park that Jonestown KOA is linked to via the local trail system. The campsites along the "Swattie", as the creek is called locally, have a concrete pad, and steps leading down to the water. The waters of the creek by these campsites can move pretty well, but unless rain swollen, are easily waded in. The girls have a blast (and me too!) trying to catch crawdads, fish, and other creatures found there. Jonestown KOA also acts as a local water-sports outfitter, so you can rent canoes, kayaks and tubes to go for a float. The campground will even transport you a mile or two upstream, and you can float back to your campsite. If you don't want to just relax at your campsite or float the Swattie, there are great things to do close by, or within a 30 minute drive. The Indian Town Gap Military base and the VA National Cemetery are just up Fisher Avenue from the Campground. Though we haven't figured out how to tour any of the facility, there's plenty of military hardware on display. Helicopters, transport planes, jets, and tanks are on display to check out. Most have signage relating to their history or what engagements they were a part of. If you are into motorsports, then check out the Friday night excitement happening at Linda's Speedway. Every Friday night this small dirt oval track turns local drivers and wrench turners into heroes going for the honor of hoisting the checkered flag on the victory lap. There's loud noise, a few spills, and plenty of sights to entertain as they race around in specialized vehicles. Jonestown KOA is even a driver sponsor. Most of the racing is with Sprinter and Slingshots classes, which to the untrained eye (which would be me) look like radically souped up Go-Carts with wings. Check the schedule on Linda's website, because though the Sprinters are exciting, the Legends and Charger classes take the adventure up a notch. Legends remind me of 1940's coupes, while the chargers give off a distinctly mustang stock-car look. Whatever race you go to it's great fun, and the pricing won't break the budget. Close to the Jonestown KOA there are plenty to chose from to relieve your hunger pangs, but for true country cooking, I have two places in mind. First, the Farmers Wife's Restaurant in Ono, PA is a great homey diner experience.The interior has exposed beams for an old barn style look, but all the food inside is fresh. We love hitting this eatery for breakfast. Huge piles of hotcakes, Belgian waffles, and eggs any way you want them. They's got plenty on the menu for lunch and dinner - one day we will eat those options as well. I'm pretty sure it will be just as tasty. Our other favorite looks like a Feed store in the middle of a corn field. But as their tag line says "Follow the Smoke" for some of the best barbecue I've ever had. Shakedown BBQ in Grantville, PA is THE place for pulled pork, beef brisket, baby back ribs and even turkey and sausage. The sauce is tangy, the meat tender, and the sides are just as tasty. The whole feel of the place is laid back and friendly. When waiting for your order it's interesting to see the mix of clientele. Burly guys on gleaming Harleys, sweatered dads pulling up in Beemers or Land Rovers, and college guys in whatever junker makes it up the driveway are all in line - and even talking together. Want world peace? Get everyone talking round some good food! Check Shakedowns website to see if a local blues or country rock band will be playing to double up on a great experience. Jonestown KOA is pretty close to other attractions. In season they even have a shuttle to Hershey Park. Indian Echo Caverns is also a cool (literally) place to visit. But for us, they are just a bit far at 30 minutes or so away. If you are not from Pennsylvania and staying for a while, it's a good location to use as a "home base" to visit the Hershey area as a side trip. We love visiting and exploring the Central Pennsylvania area. We know there's still more to experience, and we don't want to miss out! If you have a favorite place to visit, explore, or to grab some good food - we'd love to hear about it in the comments section below. Happy RVing!